Scope: Total renovation of 4 level steel and masonry constructed commercial building into the new Chelsea Police Headquarters. The project entailed removing the basement slab and underpinning of the entire structure to increase the height at basement level, requiring surrounding the exterior foundation with sheet piling on three sides to retain the earth. The building was completely shored as all floors were removed. Steel, steel decking, poured concrete, floors, and steel stairs were installed. Two elevators and a sally port were constructed. The building is located on a congested site and involved extensive dewatering during the underpinning stage of the work. 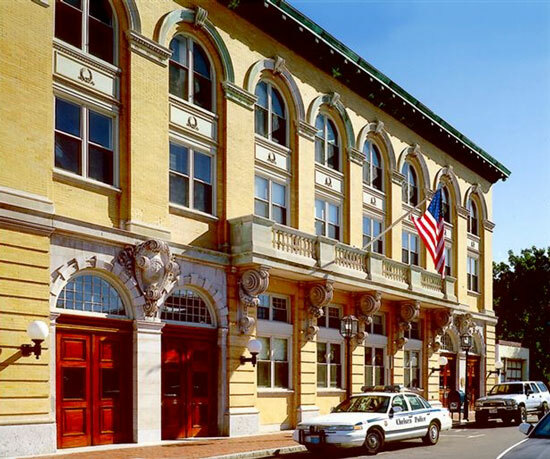 “We took a dilapidated structure in the center of a busy city with no open land and turned it into a state-of-the-art facility for the Chelsea Police Headquarters. This was one of our most challenging projects ever because of the amount of structural work done in a very confined space. The only parts of this building retained were the exterior masonry walls and the framing structure of the roof. First, we had to underpin the entire foundation in four foot wide increments in order to gain approximately 3’ in height required for the new use. This work required a continuous dewatering of the space. Sheet piling had to be driven around the exterior perimeter in order to complete the underpinning and waterproof the new foundation. We removed the floor framing structure from the basement to the roof, which required the shoring of the entire structure with steel– quite a task since there was no open space on any side of the property and we had to preserve the structure’s historic façade.